Cuba Marks 50 Years Since 'Triumphant Revolution' Fifty years ago Thursday, the dictator Fulgencio Batista fled Cuba, clearing the way for Fidel Castro and his guerilla movement to assume power. NPR's Jason Beaubien is in Santiago for the anniversary of the "Triumphant Revolution" and talks with Guy Raz about Cubans' perceptions of their country and their role in the 21st century. Fifty years ago Thursday, the dictator Fulgencio Batista fled Cuba, clearing the way for Fidel Castro and his guerilla movement to assume power. NPR's Jason Beaubien is in Santiago for the anniversary of the "Triumphant Revolution" and talks with Guy Raz about Cubans' perceptions of their country and their role in the 21st century. Today in Cuba, the government is marking the 50th anniversary of Fidel Castro's Cuban Revolution. 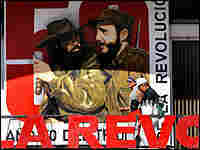 It was on January 1st 1959 that Castro's guerillas ousted U.S.-backed dictator Fulgencio Batista. Castro eventually imposed a hard line Marxist/Leninist regime on the island. Despite the fall of the Soviet Union and an ongoing U.S. embargo, Cuba remains one of the few communist nations left in the world. NPR's Jason Beaubien is in the eastern Cuban city of Santiago where the official celebration of the anniversary is being held. Jason, how important is this anniversary? JASON BEAUBIEN: Well, this anniversary is hugely important for the Cuban government. There's sort of an air of defiance here. The Soviet Union is gone, the U.S. has been trying for regime change here for 50 years, and Cuba, under Fidel, has done things Fidel's way. And the relationship between the U.S. and Cuba has really dominated the last five decades. The U.S. broke off diplomatic relations back in 1960 after Castro nationalized U.S. business interests here. Then in 1962, you had the Cuban Missile Crisis, which brought the world to the brink of nuclear war. You know, the U.S. has tried an outright coup attempt during the Bay of Pigs, and Washington still has tough sanctions and an economic embargo against Cuba. This is the 50th anniversary of this Communist government, and it's a chance for them to say, look, we're still here. RAZ: Mm hmm. Well, 50 years now after the revolution, what's the state of the country? BEAUBIEN: You know, 50 years later, much of Havana appears to be falling apart. You've got buildings that are crumbling. You know, in 2004, the National Electrical System collapsed. Infrastructure is just in a terrible condition. The economic minister this week said that Cuba is going through the worst period since the fall of the Soviet Union, when the Soviet Union, its major benefactor, collapsed. You've got a soaring trade deficit. So, things are really tough here. This is a tough time for Cuba. RAZ: Jason, what about ordinary Cubans? What are you hearing from them about all of this and about how they view the incoming American President Barack Obama? BEAUBIEN: Well, obviously there's a lot of frustration in some quarters; wages here are about $20 a month, but there's also a lot of pride here. People here feel like Cuba has gone its own way. As a developing country, it has managed to get universal healthcare. It's got free education. It's got a Communist system that guarantees basic food rations for everyone. People complain it might not be enough, but there's a sense of pride that Cuba has accomplished a lot. And there's also a lot of hope that under the new administration, under an Obama administration that the relationship which has dominated the last 50 years will change between the U.S. and Cuba and that it lead to an improvement here on the island. RAZ: Mm hmm. And Jason, in the middle of these celebrations in Cuba, where is Fidel Castro? BEAUBIEN: Well, that's a state secret. Fidel has not been seen in public since 2006. He's 82 now. He's had stomach problems. He handed over power to his brother Raul back in 2006; formally, it was handed over this year. And in the past, Fidel had been writing very lengthy articles up until just recently in Granma on all sorts of subjects. And it's striking that today on this 50th anniversary, Fidel had just one line in Granma, on the front page. This is a man who used to give speeches that went on for hours, and today all he said was that he was wishing the heroic people of Cuba a happy anniversary. RAZ: Mm. Well, NPR's Jason Beaubien, thank you so much for being with us. RAZ: That's NPR's Jason Beaubien speaking with us from the eastern Cuban city of Santiago. 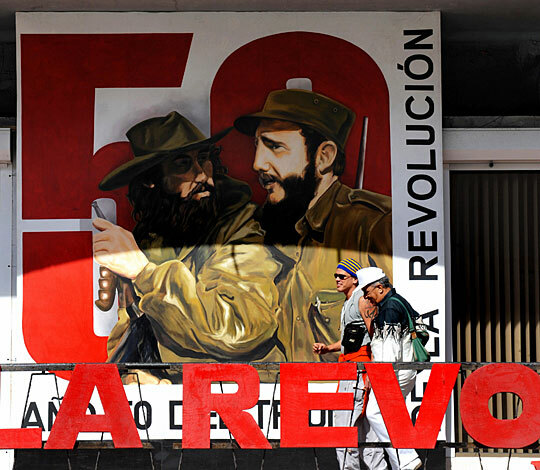 A banner depicting Fidel Castro and a guerrilla leader hangs in downtown Havana. Jan. 1 marks the 50th anniversary of the Cuban Revolution, when Fulgencio Batista was forced to flee Cuba. Fidel Castro came to power in Cuba 50 years ago today. Dictator Fulgencio Batista, reviled as a corrupt tyrant, fled the island in the early morning hours as Castro's rebel forces entered Havana, and people poured into the streets on New Year's Day to celebrate. The U.S. reaction to Castro's victory was mixed: Batista was seen as a reliable ally almost to the end, but Castro had supporters inside the U.S. government. Many were in the CIA — the very agency that would soon try to overthrow him. For people in the United States, the story of Castro and his ragtag guerrillas triumphing over Batista's army could hardly have been more dramatic. "The forces of Castro's 26th of July Movement, named for the anniversary of his first attack on the regime in 1953, have grown vastly. Nearly two years of hit-and-run warfare culminated in victory as 1958 ended," announced one U.S. newsreel, featuring scenes of Castro's men arriving in Havana to a wild reception. "Now Batista has fled. A new leader is on the scene — Fidel Castro — in many ways an unknown quantity in his politics and policies, but certain to be dominant in Cuba's new era just begun." The uncertainty surrounding Castro stemmed in part from the raucous scenes that accompanied his triumph. On Jan. 1, 1959, his supporters stormed the casinos in Havana hotels, tearing them apart as symbols of the Mafia-controlled gambling world that Batista had allowed to flourish on the island. "I slept the next two nights in the lobby of the Hotel Nacional because we started evacuating American citizens," says Wayne Smith, then a young U.S. diplomat based at the embassy in Havana. "Not that there was really any danger, but a lot of people — a lot of American citizens who were there as tourists — wanted to go. They wanted to get out of there, so we organized an evacuation from the lobby of the Hotel Nacional." In Washington, officials were shocked. The U.S. had stopped sending arms and ammunition to Batista a few months earlier, but the speed with which his regime collapsed caught President Dwight Eisenhower and his administration by surprise. Historian Thomas Paterson, the author of Contesting Castro, points to a meeting of Eisenhower's national security team on Dec. 18, 1958, just two weeks before Castro took power. "Eisenhower is told by Allen Dulles, the CIA director, and others that the rebels are moving very fast from the eastern part of the island to the central part, and Eisenhower says, 'Well why wasn't I told this before?' " Paterson says. It is now known that there were many U.S. reports about Castro's popularity in Cuba and about Batista's loss of support, but apparently those reports weren't all passed on to higher levels. The U.S. ambassador in Cuba, Earl E.T. Smith, was a strong Batista supporter, and those who knew him say Smith was in denial right to the end about the strength of Castro's movement. "Earl Smith did not trust Castro at all," says Jay Mallin, a correspondent for Time magazine in 1958 who had many meetings with Smith. "He thought he was a Communist even back then, and he did everything he could to prevent him coming in." Smith was a political appointee, not a professional diplomat, and he didn't always pay close attention to his political officers or to the CIA agents assigned to Cuba at the time. Wayne Smith, who was a vice consul at the embassy, recalls that the CIA officers he knew were predicting Batista would be overthrown. "From talking to them in the snack bar and at parties, I had the impression that most of the guys in the station didn't think Batista could win," Smith says. "They probably would have preferred to see some negotiated solution so that someone other than Castro would come in, but if that was not possible, then Castro was going to win. They were realistic enough to understand that." It's the job of intelligence officers to know what is happening in their countries, and in 1958 Havana, CIA agents were keeping close track of the rapidly growing revolutionary movement. But Mallin says agents who got too close to Castro's followers could get in trouble with Earl Smith. "Put it this way — they were certainly in touch with the underground, but they would have to be careful because the ambassador was against it," Mallin says. "So I can see there would be friction." The best CIA reporting on Castro and his followers came from Santiago, the city at the eastern end of Cuba where the movement was strongest. Robert Chapman, the chief CIA officer in Santiago, was on his first field assignment when he arrived in 1957 and found himself in the center of a revolution. "I knew everybody in town, more or less," Chapman says. "The press was coming through. I would brief them on security, and I later found that my name was posted in the New York Press Club. If you're going to see Castro, see Bob, you know?" Castro was originally from eastern Cuba, and Santiago was a hotbed of revolutionary activity in 1958. Chapman couldn't have asked for a better assignment. "I had most contact with what was the civil resistance movement," Chapman says. "They formed a group to support the revolutionaries, and I had very good contact with them. And I occasionally had contact with the underground itself, the 26th of July Movement. It was great because there was action taking place at all times." Some writers have alleged that Chapman covertly aided Castro and his followers, even that he personally directed $50,000 in CIA funds to the rebel group. Chapman vigorously denies such allegations, saying he was suspicious of Castro and dutifully reported that the Cuban had Communist connections. But Chapman says the CIA officer who immediately preceded him in Santiago, Bill Patterson, was indeed sympathetic to the revolutionary movement, and says he doesn't rule out the possibility that Patterson may have given Castro's movement some material support. "When [Patterson] introduced me to these people that he knew in the civic resistance movement, I mean, he was wildly embraced. I mean, he was actually almost loved," Chapman says. "And I thought that very unusual at the time, that an intelligence officer would have such relationships with the people in the civic resistance." Patterson, who died a few years ago, later turned against Castro, as did many of Castro's U.S. supporters. But Earl Smith, the ambassador, never got over what he saw as CIA officers' excessive sympathy for the Cuban revolution. In his 1962 memoir, Smith wrote, "There is no advantage to the United States in sending an Ambassador to a country if the CIA representatives there act on their own and take an opposite position." Smith might have been exaggerating the extent of CIA support for Castro, but in any case, it didn't last long. Within 15 months of Castro's triumph, CIA officers in Cuba were seeking out his opponents and attempting to organize a new counterrevolution.